This article is about the film. For the video game, see Back to the Future Part III (video game). Back to the Future Part III is a 1990 American science fiction Western comedy film and the third and final installment of the Back to the Future trilogy. The film was directed by Robert Zemeckis, and stars Michael J. Fox, Christopher Lloyd, Mary Steenburgen, Thomas F. Wilson and Lea Thompson. The film continues immediately following Back to the Future Part II (1989); while stranded in 1955 during his time travel adventures, Marty McFly (Fox) discovers that his friend Dr. Emmett "Doc" Brown, trapped in 1885, was killed by Buford "Mad Dog" Tannen (Wilson), Biff's great-grandfather. Marty travels to 1885 to rescue Doc and return once again to 1985, but matters are complicated when Doc falls in love with schoolteacher Clara Clayton (Steenburgen). 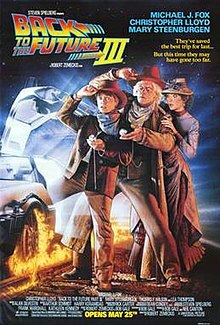 Back to the Future Part III was filmed in California and Arizona, and was produced on a $40 million budget back-to-back with Part II. Part III was released in the United States on May 25, 1990, six months after the previous installment. Part III earned $244.5 million worldwide, making it the sixth-highest-grossing film of 1990. On November 12, 1955, moments after witnessing his apparent death via lightning bolt, Marty McFly (from 1985) learns that Dr. Emmett Brown (also from 1985) was transported to 1885 and is trapped. Marty and Doc's 1955 self use the information in Doc's 1885 letter to repair the DeLorean, with 1885 Doc instructing Marty to return to 1985 and leave him be. Marty spots a tombstone with Doc's name, dated six days after the letter, and learns that Doc was killed by Biff Tannen's great-grandfather, Buford. Marty takes a picture of the tombstone and travels to 1885 to save Doc. Marty arrives on September 2, 1885, in the middle of a Cavalry pursuit of Indians. When the DeLorean's fuel line is torn, Marty hides the car in a cave and walks to Hill Valley. He meets his Irish-born great-great-grandparents, Seamus and Maggie McFly, and runs afoul of Buford and his gang. Buford attempts to lynch Marty, but Doc rescues him. Doc agrees to leave 1885, but because gasoline is not yet available, the DeLorean cannot reach the 88 mph (142 km/h) required to activate the time-travel device. Doc devises a plan to use a locomotive to push the DeLorean up to the required speed. While he and Marty explore a rail spur they intend to use, they spot a runaway horse-drawn wagon. Doc saves the passenger, Clara Clayton, and the two fall in love. Marty and Doc find out that Clara was supposed to die in a ravine and they have altered history. At a town festival, Buford tries killing Doc, but Marty thwarts him. Buford insults Marty and challenges him to a showdown in two days; in his anger, Marty accepts. Doc's name disappears from the photograph of the tombstone, but the date remains unchanged; Doc warns that Marty might be the one killed. Marty and Doc place the DeLorean onto the spur, and Doc makes Marty promise that once he returns to 1985 the DeLorean will be destroyed. Unable to convince Clara that he is from the future, Doc is spurned. He goes to the saloon for a binge, but Marty convinces Doc to leave with him. Doc drinks a single shot of whiskey and passes out. Buford arrives and calls out Marty, but Marty refuses to duel. Doc awakes after drinking the bartender's special "Wake-Up Juice" and tries fleeing with Marty, but Buford's gang captures Doc, forcing Marty to duel. After fooling Buford into thinking he has killed Marty using a bulletproof plate, Marty knocks Buford into a wagon full of manure. Buford is arrested for an earlier robbery. As Clara leaves on the train, she overhears a salesman discussing how heartbroken Doc was. Clara applies the emergency brake, returns to town and rides after him after discovering Doc's time travel plans. Stealing the locomotive at gunpoint, Doc and Marty begin pushing the DeLorean along the spur line. Clara boards the locomotive while Doc climbs toward the DeLorean. Doc encourages Clara to join him, but she falls, hanging by her dress. Marty passes his hoverboard to Doc so he can save Clara. They coast away from the train as it falls off an unfinished railroad bridge; Marty travels to 1985 on the completed bridge. Marty arrives on October 27, 1985, escaping the powerless DeLorean before it is destroyed by an oncoming freight train. He discovers that everything has returned to the initial post-time travel timeline, and finds Jennifer sleeping on her front porch. He uses the lessons he learned in 1885 to avoid being goaded into a street race with Douglas J. Needles, avoiding a possible automobile accident. Remembering that this accident would have sent Marty's life spiraling downward, Jennifer opens a fax message she kept from 2015, and watches as its text regarding Marty's firing disappears. As Marty and Jennifer examine the DeLorean wreckage, a locomotive equipped with a flux capacitor appears, manned by Doc, Clara, and their two children Jules and Verne. When Jennifer asks Doc about the fax, Doc replies that their future will be shaped by their choices and actions. After exchanging goodbyes, the train disappears into an unknown time. The origins of the western theme for Back to the Future Part III lie in the production of the original film. During filming for the original, director Zemeckis asked Michael J. Fox what time period he would like to see. Fox replied that he wanted to visit the Old West and meet cowboys. Zemeckis and writer/producer Bob Gale were intrigued by the idea, but held it off until Part III. Rather than use existing sets, the filmmakers built the 1885 Hill Valley from scratch. The western scenes were filmed on location in Monument Valley. Some of the location shooting for the 1885 Hill Valley was done in Jamestown, California, and on a purpose-built set at the Red Hills Ranch near Sonora, California. Some of the train scenes were filmed at Railtown 1897 State Historic Park, a heritage line in Jamestown. Whereas the original film played to a more materialistic idea of success, Zemeckis considered Part III more of a "human journey" with spiritual overtones. The shooting of the Back to the Future sequels, which were shot back-to-back throughout 1989, reunited much of the crew of the original. The films were shot over the course of 11 months, save for a three-week hiatus between filming of Parts II and III. The most grueling part was editing Part II while filming Part III, and Zemeckis bore the brunt of the process over a three-week period. While Zemeckis was shooting most of the train sequences in Sonora, Gale was in Los Angeles supervising the final dub of Part II. Zemeckis would wrap photography and board a private plane to Burbank, where Gale and engineers would greet him on the dubbing stage with dinner. He would oversee the reels completed that day, and make changes where needed. Afterwards, he would retire to the Sheraton Universal Hotel for the night. The following morning, Zemeckis would drive to the Burbank Airport, board a flight back to the set in Northern California, and continue to shoot the film. Although the schedule for most of the personnel involved was grueling, the actors found the remote location for Part III relaxing, compared to shooting its predecessor. The role of Clara Clayton was written with Mary Steenburgen in mind. When she received the script, however, she was reluctant to commit to the film until her kids, who loved the original, 'hounded' her. Lloyd shared his first on-screen kiss with Steenburgen in Part III. The Hill Valley Festival Dance scene proved to be the most dangerous for Lloyd and Steenburgen; overzealous dancing left Steenburgen with a torn ligament in her foot. The film also starred veteran western film actors Pat Buttram, Harry Carey, Jr., and Dub Taylor, as three "saloon old timers". Buttram was also known to younger audiences for his extensive voice work, particularly as the Sheriff of Nottingham in the Disney version of Robin Hood. The inclusion of these noticeable Western actors was promoted in several documentaries about the film as well as the behind-the-scenes documentary of the DVD and in the obituary of one of the actors. The musicians of the Old West–style band in the film were played by ZZ Top. Shooting a film set in the Old West was appealing to the stuntmen, who were all experienced horse riders. "We had every great stuntman in Hollywood wanting to work on Part III," recalled Gale in 2002. Thomas F. Wilson, who played Buford Tannen, chose to perform his own stunts and spent a great deal of time learning to ride a horse and throw his lariat. Filming was halted when Michael J. Fox's father died and when his son was born. Alan Silvestri, through his longtime collaboration with Zemeckis, returned to compose the score for Back to the Future Part III. Rather than dictate how the music should sound, Zemeckis directed Silvestri as he would an actor, seeking to evoke emotion and treating every piece of music like a character. The photography in Part III was a "dream" for cinematographer Dean Cundey, who agreed with much of the crew in his excitement to shoot a western. The filmmakers sought a bright, colorful picture for each scene, with a hint of sepia tone in certain shots. Zemeckis wished to create a spectacular climax to the film. He coordinated the actors, a live 4-6-0 ten wheeler steam locomotive, pyrotechnics, and special effects, and countless technicians all at once. As they had done with the previous two films in the trilogy, the visual effects for Part III were managed by effects company Industrial Light & Magic; the head of its animation department, Wes Takahashi, returned to once again animate the DeLorean's time travel sequences. The film grossed $23 million in its first weekend of U.S. release and $87.6 million altogether in U.S. box office receipts (or about $152.4 million when adjusted for inflation as of January 2011) – $243 million worldwide. On December 17, 2002, Universal released Back to the Future Part III in a boxed set with the first two films on DVD and VHS. In the DVD widescreen edition, there was a framing flaw that Universal has since corrected, available in sets manufactured after February 21, 2003. The review aggregate website Rotten Tomatoes reported a 74% approval rating, based on 43 reviews, with an average rating of 6.5/10. Kim Newman of Empire gave the film four out of five stars, saying that the film "restores heart interest of the first film and has a satisfying complete storyline". He praised Michael J. Fox for "keeping the plot on the move," and mentioned that Christopher Lloyd and Mary Steenburgen's romance was "funny". He said that the film's ending was the "neatest of all," and it "features one of the best time machines in the cinema, promising that this is indeed the very last in the series and neatly wrapping it up for everybody. Leonard Maltin preferred this film to the first two, giving it three-and-a-half stars out of four, saying it "offers great fun, dazzling special effects, and imagination to spare. There's real movie magic at work here." Michael McWhertor of the website Polygon wrote that while the film was not better than the original entry in the series, it is nonetheless "leagues better than the second"; he praised the film's comedic and romantic elements and commended Thomas F. Wilson's performance as "Mad Dog" Tannen. Roger Ebert of the Chicago Sun-Times gave the film two-and-a-half out of four stars. He said that the film's western motifs are "a sitcom version that looks exactly as if it were built on a back lot somewhere". Although Vincent Canby of The New York Times praised Christopher Lloyd's performance in the film, he also said that the film "looks as if it could be the beginning of a continuing television series". He complained that the film is "so sweet-natured and bland that it is almost instantly forgettable". Actually, I've played the same scene in that film (Time After Time) and in (BTTF) 'Part III,.. I've had a man from a different time period tell me that he's in love with me, but he has to go back to his own time. My response in both cases is, of course, disbelief, and I order them out of my life. Afterwards, I find out I was wrong and that, in fact, the man is indeed from another time, and I go after him (them) to profess my love. It's a pretty strange feeling to find yourself doing the same scene, so many years apart, for the second time in your career. The casting of Steenburgen for Back to the Future III appears to be deliberately intended to mirror the earlier role. In Time After Time, the woman lives in the 20th century and the time traveller is from the 19th. In Back to the Future III, the woman inhabits the 19th century and the time traveller is from the 20th. In both films, the woman eventually goes back with the time traveller to live in his own time period. In 1990, the film won a Saturn Award for Best Music for Alan Silvestri and a Best Supporting Actor award for Thomas F. Wilson. In 2003, it received an AOL Movies DVD Premiere Award for Best Special Edition of the Year, an award based on consumer online voting. ^ a b c "Back to the Future Part III". AFI Catalog of Feature Films. Retrieved July 9, 2017. ^ "BACK TO THE FUTURE PART III (PG)". British Board of Film Classification. June 4, 1990. Retrieved June 21, 2015. ^ a b "Back to the Future III (1990)". Box Office Mojo. Retrieved December 31, 2016. ^ "Back to the Future Part III". CBS Interactive Inc.
^ a b c d Bob Gale, Robert Zemeckis et al. (2002). Back to the Future Part III. Special Features: The Making of Back to the Future Part III (DVD). Universal Studios Home Entertainment. ^ "Railtown 1897 State Historic Park Film Credits". railtown1897.org. Archived from the original on December 3, 2010. Retrieved October 4, 2014. ^ a b c d e f g h i j k l Bob Gale, Robert Zemeckis et al. (2002). Back to the Future Part III. Special Features: Making the Trilogy: Chapter Three (DVD). Universal Studios Home Entertainment. ^ Sorcha Ní Fhlainn, ed. (May 12, 2010). "The Worlds of Back to the Future: Critical Essays on the Films". McFarland. Retrieved November 14, 2016. ^ "Pat Buttram". Behind The Voice Actors. Retrieved November 14, 2016. ^ "soentertain.me". soentertain.me. Archived from the original on February 22, 2014. Retrieved November 14, 2016. ^ Failes, Ian (October 21, 2015). "The future is today: how ILM made time travel possible". FXGuide. Retrieved June 17, 2016. ^ "Digital Arts Faculty". International Technological University. Archived from the original on August 12, 2016. Retrieved June 17, 2016. ^ "$87,666,629.00 in 1990 had the same buying power as $152,376,558.90 in 2011". Dollartimes.com. January 7, 2012. Retrieved January 7, 2012. ^ Broeske, Pat H. (May 30, 1990). "'Back to Future III' a Fast Draw Against 'Fire Birds' Movies: Memorial weekend opening is no contest. `Future III' takes $23.7 million, while `Birds' takes $6.3 million". The Los Angeles Times. Retrieved November 16, 2010. ^ "Box Office History for Back to the Future Movies". The Numbers. Retrieved November 28, 2010. ^ "`Recall' Totally Outdistances `Future' in Box-Office Race Movies: Schwarzenegger's sci-fi flick opens with $25.5 million. But it only just edges the `Turtles' ' $25.3-million record". The Los Angeles Times. March 15, 1993. Retrieved November 30, 2010. ^ "Framing Flaws and Back to the Future Replacement DVDs". Whirlpool.net. May 19, 2010. Retrieved November 28, 2010. ^ "Back to the Future Part III". Rotten Tomatoes. Retrieved November 28, 2010. ^ Newman, Kim. "Back To The Future: Part III". Empire. Bauer Consumer Media. Retrieved August 30, 2012. ^ Maltin, Leonard (2008), p. 78. Leonard Maltin's 2009 Movie Guide. Signet Books. ^ McWhertor, Michael (October 21, 2015). "Back to the Future Part 3 is perfect (and better than Part 2)". Polygon. Retrieved June 23, 2016. ^ Ebert, Roger (May 25, 1990). "Back to the Future Part III review". Chicago Sun-Times. Retrieved November 18, 2010. ^ Canby, Vincent (May 25, 1990). "A Trilogy Whose Future Has Passed". The New York Times. Retrieved August 30, 2012. ^ Spencer Bennett (November 2, 2015). "WHAT TIES THESE FIVE TIME-TRAVEL MOVIES TOGETHER? – [VIDEO]". mix979fm.com. I was noticing the time-traveling ties between 'Time After Time' (1979) and another movie 'Back to the Future III' (1990), a film also starring Mary Steenburgen. In 'Time After Time', she played Amy Robbins, a 20th Century woman who falls in love with a time traveller, H.G. Wells (played by Malcolm McDowell) from the 19th Century.... In Back to the Future Part III (1990), she played Clara Clayton, a 19th Century woman who falls in love with a time traveller, (played by Christopher Lloyd) from the 20th Century. ^ "Mary Steenburgen ("Clara Clayton Brown")". backtothefuture.com. ^ Christopher Campbell (October 21, 2015). "10 Movies to Watch After You See Back to the Future Part III". filmschoolrejects.com. Steenburgen was sought to play Clara in part based on her role in this movie where she plays the love interest of another time traveller. Instead of a man from the future who is a fan of a famed 19th century sci-fi and fantasy author, her leading man is from the past and an actual famed 19th century sci-fi and fantasy author, H.G. Wells (Malcolm McDowell)... he brings Steenburgen’s character back to his own time period, just as Doc does with Clara. ^ a b "Ultimate Facts: back to the Future Part III". thefilmbox.org. The role of Clara Clayton was written specifically for Mary Steenburgen. – In the film, Clara Clayton is a 19th Century woman who falls in love with a time traveler from the 20th Century. In Time After Time (1979), Mary Steenburgen played Amy Robbins, a 20th Century woman who falls in love with a time traveler from the 19th Century.Century. ^ "Film / Back to the Future Part III". tvtropes.org. Actor Allusion: Mary Steenburgen stars as a woman who falls in love with a time-traveler, just like in Time After Time... Also worth noting is in this film, she is a 19th century woman who falls in love with a 20th century time-traveler, the opposite of her role from Time After Time, where she was a 20th century woman who falls in love with a 19th century time-traveler. ^ Sorcha Ní Fhlainn (August 1, 2016). "'There's Something Very Familiar About All This': Time Machines, Cultural Tangents, and Mastering Time in H.G. Wells's The Time Machine and the Back to the Future trilogy". Adaptation. 9 (2): 164. The conclusion to Back to the Future III (where both Doc and Clara travel to 1985 to meet with Marty once more, in a new time machine constructed within a steam-powered locomotive), intertextually connects this moment with the conclusion of Meyer’s Time After Time, where H.G. Wells (Malcolm McDowell) not only prevents Jack the Ripper (David Warner) from continuing his murder spree in San Francisco in 1979, but also brings Amy Robbins (also played by Mary Steenburgen) back to Victorian England with him. Thus, both women are positioned as a reward for the time traveller’s dedication and emotional connection to the machine. Both Clara and Amy are permanently relocated by their respective masters of time, just as Wells’s Time Traveller had intended with Weena. ^ "Past Saturn Awards". The Academy of Science Fiction, Fantasy & Horror Films. Archived from the original on April 4, 2007. Retrieved November 28, 2010. ^ "Back to the Future awards". IMDB. Retrieved November 28, 2010. Wikimedia Commons has media related to Back to the Future Part III. Wikivoyage has a travel guide for Back to the Future Part III. This page was last edited on 19 April 2019, at 11:17 (UTC).